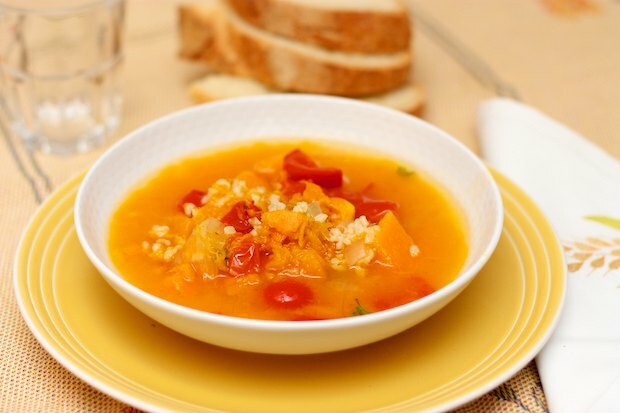 This recipe combines the last tomatoes from the garden with pumpkin. This recipe uses “Originario” rice, a short grained Italian rice that is ideal for making soups. This rice is tiny and round and is suitable for absorbing the liquid. If you live in a place where you can’t find this particular variety, try a rice with the same characteristics that are described above. This soup needs at least an hour to cook to allow the ingredients to blend so that they develop a flavorful broth. You don’t have to worry about the long cooking time because once you put the pot on low heat, there is no need to stir it so you can leave it to cook. Soups can also be cooked the day before or cooked in large quantities and then frozen in containers of appropriate size for your family. You can defrost the soup in the microwave or on the stove, as you see fit. I guess you could say that soups are a time saver and therefore accessible to even the most busy people. Cut the pumpkin into small pieces, onion into thin slices, and the tomatoes in half. Add the water, 2 teaspoons of granulated vegetable broth, the sage, and a bit of salt to a large pot. Simmer for about 60 minutes. Pour the rice and cook time indicated in the package. Serve in individual dishes with a bit of olive oil, a tablespoon of parmesan cheese, a torn basil leaf, and if you like, a little pepper. Posted in Soups and tagged with Autumn Soup, Zuppa d’Autunno. RSS 2.0 feed.